BolteLang’s fifth exhibition is yet another variation on the two person format that identifies the gallery’s first year of exhibitions: the artist Lukas Wassman shows a series of photographs that all feature Eva, a performer and dancer who is his collaborator and muse of several years. Some of the images form part of other chapters in the artist’s work, others are independent snapshots; all together they form a compelling body of work that has never been shown before. 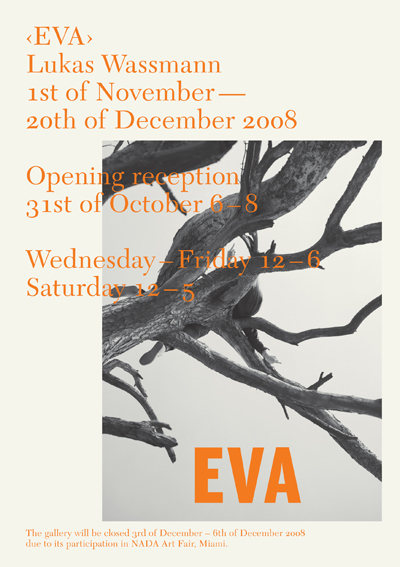 The works shown in this exhibition give an overview of his practice, several different types of work in which Eva appeared from time to time. One series combines carpentry and photography, when Wassmann made objects out of wood that then become the centrepieces of staged images; another captures momentary performative gestures and immortalises them. Some are considered and deliberate, others snapshots of playful actions. In some Eva too orchestrates the scene presented, in others she is a passive presence. Each image exists as an autonomous work, but can also form a chapter of a recurring theme of enquiry. Wassmann’s approach is deliberately straightforward; he is resistant to over- conceptualisation and creates images that give what is visible preference over the excessively intellectual. The series of photographs shown at BolteLang are testament to his work as a young artist, to lasting preoccupations and to the continued presence of an inspirational figure in his practice. Lukas Wassmann was born in Zürich in 1980 and completed an apprenticeship as a carpenter before studying photography in Berlin and Zurich at the then HGKZ. He now pursues independent work and artists’ books alongside commissioned photography for selected clients. Eva Maria Küpfer studied Dance and Choreography in Paris and at ArtEZ in Arnhem, Netherlands. Her last creation “Schau der Dinge” was shown at Theaterhaus Gessnerallee Zurich in September.